There are different ways to build regions in space. You can build region assets in other software packages and import into Unity. You can use Unity's mesh shapes and terrain tools, and you can grab third party assets from the Unity Asset Store. If you want to upload a region quickly, click on 'File>New Sinespace Scene' in Unity to instantly create a quick-start region. You can upload any scene you create in Unity as a region in Space. When you create a new scene in Unity it will by default have a light and a camera. You need to delete the camera (by selecting it in the Hierarchy window and clicking delete). You need to define where users arrive when they log in to your region; and what direction they are facing. 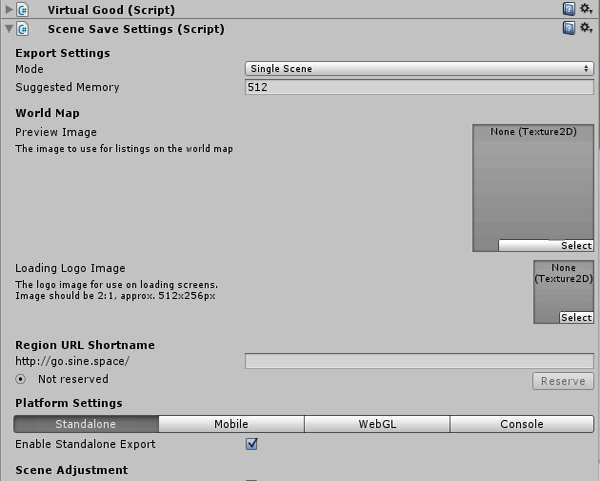 To do this, once your scene is set up, from the top menu in Unity select Game Object / Create Other / Landmark. Create empty object, then in the Inspector, add "Landmark behaviour" component. This will place a new landmark item in your scene. In the Inspector window, set the type to Landing Zone and tick Spawn Point. The in scene object is a yellow edged transparent plane which you can position anywhere in your scene. The yellow arrow points in the direction your visitors will face when they arrive. Be careful to position the landing zone slightly above the terrain; if a tall avatar's feet arrive below the terrain they may fall through. This does not apply if you are using Multi-Scene Mode & Multi-Scene Editing. You can have more then one scene in your region. 1 - Create a new scene in your current Sine.Spaces project. 2 - Double click the new scene in your Assets to load it into the Hierarchy. 2 - Design your scene. Be sure to save it. 3 - When ready to upload to the server click on 'Space' Scene Settings. 4 - Fill out the needed information, map pictures, and click Automatic Submission. If you want to make your region as a home type, which could be edited by the users themselves, you need to attach a component which is called "Room Floor" to one of the item in the scene, usually the terrain or the object used as a field. With at least one room floor component, the region will show "Edit Room" button when you in it. You can add several Room Floor components to different objects, each floor can be shared to another user, gives him/her the authority to edit. In your inventory, you will also find an item with same name of the region. This is a home template. You can use it in "Edit Room" -> "Design" function, to change the whole set of a region. Of course you could set a price for it when upload, so other user can buy it in the shop. Please see our Room Floor page for more information on the Room Floor component. Please pay attention that ALL the room edit info, like where you put some furniture is recorded in this "Room Floor" script. When you update your region, try not to remove this component in whatever situation. If you remove an old one then attach a new one to another object, the region update will cause all the users who are using your region template to find their region has gotten reset. If you must do that, try to let users of your template know this and be prepared for the overhaul updates. If you want to add a day/night cycle to your home region/template, please do see our Day/Night Cycle page for more information. After placing your landmark, go to 'Sinespace' at the top of Unity, and choose 'Scene Settings'. For more advanced settings, you can see our post zones page here and also our lighting an interior page here. You can also see how Navigation Bake works here, and we also have information on Occlusion Bake/Culling here. There are also some handy lighting tips here.